Caroline Chisholm (1808-1877) was one of the most famous people to visit the Victorian goldfields during the 1850s. Unusually for a woman at this time, she pursued a public career in philanthropy that made her a household name both in Britain and in Australia. When she arrived in Melbourne in 1854 she was at the height of her fame. Born Caroline Jones, she grew up on a comfortable farm near Northampton in England, in a family with interests in Evangelical philanthropy. When she married Archibald Chisholm of the East India Company at the age of 22, it was on condition that she could continue her philanthropic work. Her husband supported her faithfully in this endeavour throughout their marriage. He was a Roman Catholic and Caroline converted to Catholicism at this time. They spent the period from 1832-8 in Madras, where Caroline established a Female School of Industry for the Daughters of European Soldiers, then travelled to Sydney on leave in 1838 along with their three sons. Object courtesy Public Record Office Victoria. The Chisholms settled at Windsor, north-west of Sydney, and Caroline remained there with her sons when Archibald was recalled to India in 1840. She became increasingly concerned about the plight of single immigrant women arriving in Sydney without accommodation, and initially sheltered many in her own home. By 1841 she had persuaded Governor Gipps to allow her to use part of the old immigration barracks for a Female Immigrants' Home. She supported her endeavours by public subscription and offered a free employment registry to place these women in appropriate situations. Further employment agencies were established in rural areas over the next year and she travelled constantly into the country herself, conducting immigrants to their places of employment. By the time her husband retired from active service and re-joined her in 1845, she was famous throughout the colony. They returned to Britain in 1846. Mrs Chisholm shared conventional Victorian views on the importance of family life as the foundation of an ordered society. She believed in particular in the civilising power of women and children (she used the phrase 'God's police' more than once). With that in mind she and her husband succeeded in attracting enough patronage to establish a Family Colonization Loan Society to assist families to emigrate to eastern Australia and to find them employment on arrival. The society established branch committees throughout Britain and had agents in Adelaide, Melbourne and Sydney. In 1851 Archibald Chisholm sailed for Melbourne to manage that branch office. Caroline remained in Britain, travelling incessantly, and providing advice to government on immigration. It is thought that she was influential in securing the passage of the Passenger Act of 1852, which improved the regulation of shipboard conditions. One ship owner even named a vessel for her - the Caroline Chisholm. Mrs Chisholm returned to Australia in 1854, arriving in Melbourne in July. She was welcomed at a public reception and settled into what was described as 'a humble cottage in Flinders Lane'. The editor was not her only admirer. Charles Thatcher, the enormously popular entertainer known as the Colonial Minstrel, sang humorously of the 'Scumptious young gals' arriving at the diggings to enliven society. Because she's kept up such a constant supply. Mrs Chisholm may, or may not, have appreciated this reference from Charles Thatcher! Back in Melbourne by November Mrs Chisholm addressed a large public meeting on what she saw as the main problems of the diggings. Not surprisingly she deplored the overwhelming masculinity of goldfields life and in particular the large number of married men whose wives and families languished in Melbourne. This she attributed to the appalling state of the roads and the absence of affordable, respectable accommodation en route. The editor of the Bendigo Advertiser applauded her work, and heartily endorsed her belief in the reforming power of woman. The absence of the benign influence of female society is severely felt, and nearly ninety-nine men out of a hundred will feelingly admit the truth of Mrs. Chisholm's remarks on this subject. With characteristic energy and determination she set about finding a solution. Within weeks she had enlisted the support of many leading (male) citizens of Melbourne in a fund-raising effort to build a series of shelters along the main routes to the diggings. In the attached letter, she sought the assistance of Lieutenant-Governor Sir Charles Hotham in making Crown land available for the erection of accommodation stations, and voting some funds from the five-shilling tax collected from every arrival under the Passenger Act to allow Immigration Agents to purchase tickets for immigrants wishing to travel inland. Hotham agreed, on condition that the shelters were also maintained by Mrs Chisholm and her supporters. By November 1855 shelters on the road to Castlemaine were said to be ready to accept travellers. Mrs Chisholm continued to travel back and forth, ensuring that they were kept in order and were maintained. In 1857 she recorded making six such journeys through the notorious Black Forest during the winter months - no mean feat. The shelters seem to have operated with great success for many years, but the shelters planned for other routes were never built. Perhaps Chisholm's failing health was one reason. Financial straits may have been another. In 1855 the Victorian Legislative Council had voted the Chisholms 5,000 pounds, with a further 2,500 pounds voted by public subscription, in recognition of their achievements, but also noting their financial position, which was not strong. By this time they had sent out some 3,000 immigrants, but were in some personal financial distress. They used part of the funds to open a store. In 1857 Caroline Chisholm was nearly fifty. She had borne six children and kept up a punishing schedule of philanthropic work. But in this year she first experienced the crippling kidney disease that would recur for the rest of her life. The Chisholms had moved to Kyneton, where they kept a shop with the assistance of their two elder sons, but in 1858 Caroline became so ill that the doctors advised her to go to Sydney for treatment. In the next few years she battled both illness and poverty, but by 1862 had recovered sufficiently to open a school for girls. She had largely retired from public life by this time. In 1866 the Chisholms left for England, intending to settle their youngest children in school there. Caroline hoped to return to what had become her home, but ill-health was to prevent it. For the last five years of her life she was bedridden, living in poor circumstances in miserable lodgings. She died in 1877. Her husband died shortly afterwards and they were buried together in Northampton. The tombstone read 'The Emigrant's Friend'. When she visited Victoria in the mid-1850s Caroline Chisholm was almost a celebrity. Her work was widely supported, her opinions sought out and respected. Within a few years all this changed. Ill health and poverty drove her into obscurity and when she died in England the press scarcely noted her passing. Historian Patricia Grimshaw charts the ways in which Caroline Chisholm eventually re-entered popular memory in Australia in her thoughtful introduction to the revised (1990) edition of the first full-length biography of Chisholm, written by the young Margaret Kiddle in 1950. Kiddle was herself exceptional - one of very few female academic historians in a profession dominated by men. Tragically she died young, also a victim of kidney disease, but her biography re-established Caroline Chisholm as a notable character in Australian history. In 1967 the first Australian five dollar note initially featured her portrait on one side, with Sir Joseph Banks on the other. This was recognition indeed! 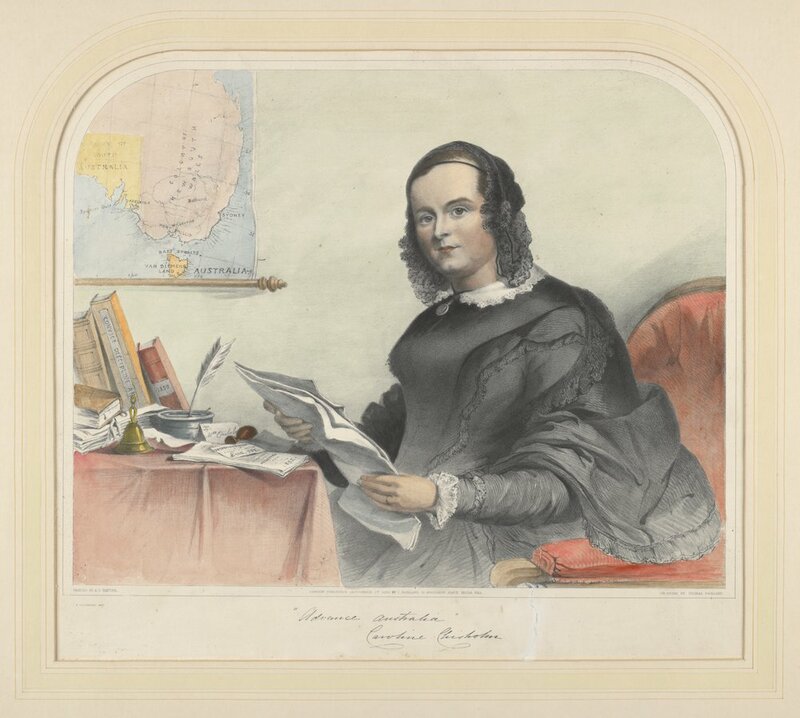 However historians today may interpret the significance of Caroline Chisholm's life, she remains central to current debates about colonial Australia, and women within it. Note that Mrs Chisholm addressed her letter to 'His Excellency the Governor of Victoria', though Hotham was not raised to this position until the following year. Having lately returned from the Bendigo, Simson's and Castlemaine Diggings, I beg to call your Excellency's attention to the great want of accommodation along the lines of Road for the wives and families of Diggers, as well as all newly arrived Immigrants who may wish to make their way into the interior in search of more profitable employment than they can now find in Melbourne. Good and respectable Hotels are to be met with along the line of road, and considering the enormous rents they pay, their charges may be considered moderate, viz. Beds 5/- & 4/-, Breakfast 4/- Dinner 4/- & 5/- Tea 4/-, Still such rates are not within the means of second class Travellers and men in search of work. Refreshment tents are freely sprinkled along the line of road where at 3/- per meal travellers can be accommodated, and although Beds can be had at 2/6 and 3/-, I doubt very much whether a family of young children would be willingly received. Bread can be purchased every few miles at from 2/- to 3/- the 4 lb loaf, Fine mutton from 6 1/2 to 8d pr lb. Consequently at these rates for all articles of consumption, Families could provide themselves with meals at the rate of 9d or 1/-. If some more reasonable mode were adopted to bring the road expenses with regard to night shelter within the range of a working man's means, we should not have so many wives and families left as they are now unprotected or hear complaints from the unemployed walking the Streets of Melbourne. I propose therefore to attempt to remedy this evil by establishing respectable homes along the line of Road where for 1/- per night Beds could be procured by Travellers and for 2d each meal they should have conveniences for cooking, the use of ....[indecipherable] taking their meals Separate from their Bed rooms. These Encampments I would propose to have at such distances from each other that females could walk from one to the other without fatigue, as I hold it to be a matter of great importance not to exhaust the system or energies of Travellers by over fatigue, sufferings, and other privations along the line of road. I beg to call upon Your Excellency's attention to the fact that the Establishment of such resting places would not immediately interfere with any established interests along the line of road, as the parties for whom I am desirous to procure cheap and respectable accommodation either sleep in the Bush, or are deterred from going into the country by the difficulties [indecipherable]..a journey. These shelter places I propose to establish on self supporting principles, securing from the profits increased comforts for the people and an extension of the system throughout the country. The first difficulties in establishing such a system of dispersion being great, I have the honor to request Your Excellency will sanction the loan of some tents to aid me in the undertaking, the same to be returned when required for the public service, also permission to occupy Crown lands for such a purpose without charges. It is perhaps right that I should very clearly state that I do not mean to recommend that stores for the Sale of goods should be kept up at these Establishments, further than that parties should be supplied with Hot & Cold Water, Soap and Candles. I propose to raise the Funds by Subscription, every subscriber to be entitled to receive 20 tickets of accommodation for one pound, Subscribers of five shillings five tickets. I beg most respectfully to call your attention to the Tax on Immigrants of 5/- on landing and would suggest that purchases of tickets could be made from that Fund and given by the Immigration Agents to such persons as may wish to push their way into the interior. I beg in conclusion to state...[indecipherable] reply to favourable to this undertaking it is my intention to ask Mr Fawkner, Mr Hodgson, Mr O'Shannassy and Mr McKinnon to aid me in establishing the Shelter System proposed. In addition to the detail of the proposal, this letter contains very useful information about the price of both food and accommodation along the roads to the diggings. Margaret Kiddle Caroline Chisholm Melbourne University Press, 1990 and 1996 (with introduction by Patricia Grimshaw). First published 1950. Patricia Grimshaw, Marilyn Lake, Ann McGrath & Marian Quartly Creating a Nation, 1788-1990 McPhee Gribble, Ringwood, 1994, especially chapters 4 & 5.